One of our recent guests was so inspiring, that we’ve decided to start a new series on our blog featuring some of our favorite visitors. We’ll start with former U.S. Ambassador to Finland Barbara Barrett who came to Kosovo in early June to explore the mountains with us. After presenting her with a few options, she chose one of our most scenic hikes: Bistra, Kosovo’s second highest peak. While we always go above and beyond for our guests, when we learned that the Ambassador is an accomplished mountaineer who owns one of Travel & Leisure’s picks for best hotel in the world, the pressure was on to make sure she had a great trip. We picked the Ambassador up from her hotel in Prishtina, stopping for coffee along the way for a small break and a bit of exploration in Prizren. We continued on to Prevalla where we began our ascent to Bistra, which we reached in just four hours! The Ambassador was kind enough to share with us her great knowledge of mountain flowers and we were at the summit before we knew it. 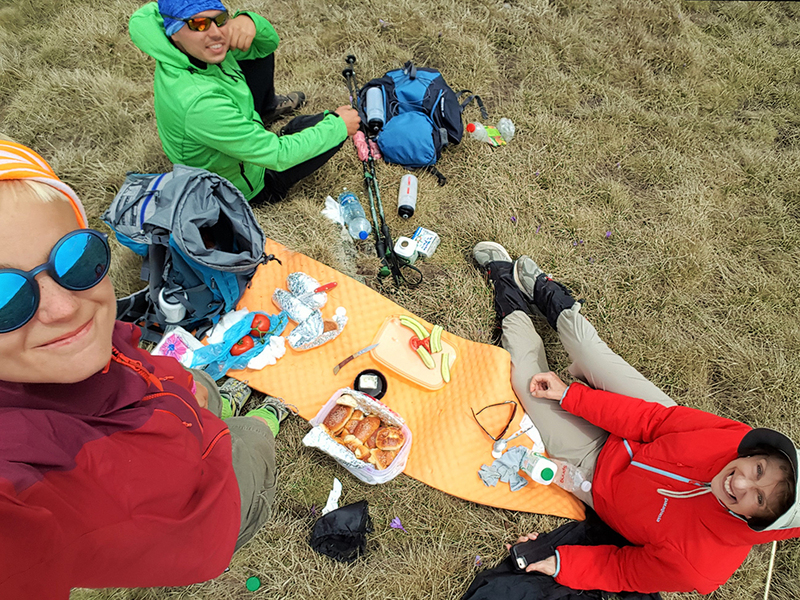 We celebrated at the summit with a delicious homemade picnic before making our way back down. In the afternoon, we arranged for a tour and dinner in Prizren before returning the Ambassador back to Prishtina. What inspired you to visit Kosovo? The courage and strength of the Kosovars through the past two decades have inspired many people; myself included. I have always wondered about the stories I read of Kosovo residents living in this sometimes rugged and always beautiful land. What surprised you most about the country when you first arrived? I won’t soon forget the food. I had the most extraordinary dinner the first night at a classic Kosovo restaurant near my hotel; a creamy, cheesy, Kaymak-inspired dish topped with mushrooms. It was heavenly! I also enjoyed the fresh and clean delicacies shared by Uta at our surprise mountaintop picnic. I was happy to see the energetic youth motoring around the main square, the music and the balloons; inducing everything from giggles to belly laughs. I was most pleased to see evidence of the intense belief in independence and the people’s desires for the future of their independent nation. Why did you choose the hike to Bistra peak? I trusted the judgment of my incomparably capable and highly recommended guide, Uta. Her reputation reached me while I was hiking in the UK. Her understanding the options, her assessment of my capabilities and her evaluation of the weather led to the conclusion that Bistra Peak would be best. I couldn’t have been more pleased. During our hike we were able to see examples of farm life, flowering saffron, a waterfall and a grand view across the mountainous border. It was beyond everything I imagined. Uta made it even more fun; her knowledge of the area was most helpful and her boundless energy inspired me. What was the best part of your experience with Butterfly Outdoor Adventure? The entire experience was one of my all-time favorites, but if I have to choose a best, it would be the thoughtful conversation and fun-loving engagement of the extraordinary Uta. What memory will you carry with you from your time in Kosovo? I look forward to a return visit. There is so much more to see and do in Kosovo and now I have absolute confidence that I know a guide who can show it well.